The caliber of a gun refers to the diameter of the bullet and the inside of the gun barrel. A firearm's caliber determines how powerful the weapon will be. Caliber is measured in inches or millimeters. Gauge is another measuring term that refers to the caliber of shells for a shotgun. A higher caliber means a larger bullet will be fired with more force. Handgun calibers can also be measured with the metric system. Millimeters are used to describe the caliber of a weapon. Metric calibers for handguns are given with an "x" between the measurements of the width and length of the bullets. For instance, a 7.62mm x 51mm Winchester pistol fires bullets that are 7.62 mm in diameter and 51 mm long. You can also refer to this same gun in inches as a 0.308 cal. Modern handguns generally range in size from 4.5 mm to 12.7 mm. A common example is the 9 mm Luger. The gauge of a gun is another term for its caliber. Gauge applies most often to shotguns and expresses the diameter of the shotgun barrel, also known as the bore. Unlike caliber measurements for other guns, a higher gauge for a shotgun means the bore diameter is smaller and the weapon has less power. Common gauges include the 10 gauge, 12 gauge, 16 gauge and 20 gauge. The 10 gauge is the most powerful caliber in this group. Thyberg, David. "List of Gun Calibers." 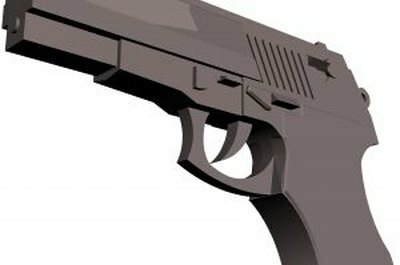 , https://legalbeagle.com/5438814-list-gun-calibers.html. Accessed 19 April 2019. Can a Felon Own a Pellet Rifle in California?